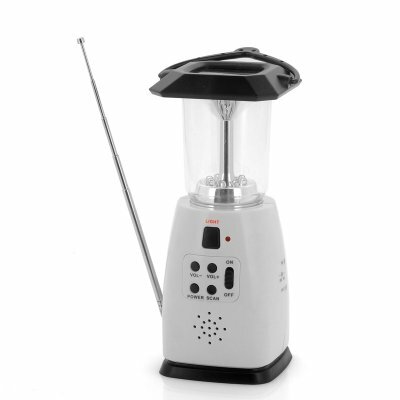 Successfully Added Hand Crank Dynamo Solar LED Lantern - FM Radio, Power Bank Function to your Shopping Cart. 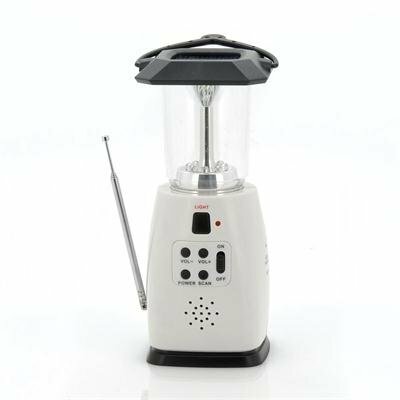 Hand Crank Dynamo Solar LED Lantern that can also be used for FM Radio also can be used as a Power Bank. Possible the best accessory to take on a camping trip or on a travel to the great outdoors is this hand crack Dynamo Solar LED Lantern. This lantern houses 8 LEDs that light up your tent effectively allowing you to see what you are doing as well as making an ideal reading light. The real benefit of this lantern is that using the included cables you can use it to charge other electronic devices such as mobiles phones making it a great power bank device as well. Having a solar panel top, this lantern can convert the energy obtained from the sunlight (20,000LUX) and convert into electrical energy over 5.5V/35mAh, also located at the side of this diverse camping light is a hand crack that when turned uses the dynamo process to convert 120 to 140 revolutions per minute into an electrical energy over 5.5V/35MAH too. In case you were wondering, a dynamo is an electrical generator that produces a direct current with the use of a commutator. In addition to all this, you can enjoy the built-in radio function with a FM sensitivity of over 28dB that can be adjusted with the easy to press buttons. A great outdoor accessory with 2-in-1 functionality. In stock now, we guarantee shipment within one working day and offer a 12 months warranty on all our products. Brought to you by the leader in electronic devices and outdoor gear, Chinavasion.